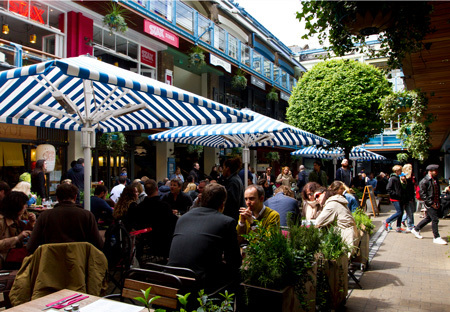 Chief executive Brian Bickell and Shaftesbury call one of London’s most vibrant neighborhoods home. Operating as a landlord in London’s West End provides some unique sustainability challenges for Shaftesbury PLC (LSE: SHB) and Brian Bickell, the company’s chief executive. Shaftesbury’s portfolio of 1.7 million square feet of commercial and residential space is clustered within the West End “villages” of Carnaby, Chinatown, Covent Garden, Soho and Charlotte Street. Street patterns and buildings in this vibrant patch of London date back to the late 17th and early 18th century, and the average age of buildings in Shaftesbury’s portfolio is around 150 years old. All of its buildings are in conservation areas, and around 25 percent of buildings are listed, meaning they have special architectural or historic interest. Bickell has been Shaftesbury’s chief executive since October 2011, following a 24-year stint as the U.K. REIT’s finance director. He recently spoke with REIT magazine on the importance of sustainability and corporate responsibility, the strategic benefits and challenges of focusing on such a unique market, and how Shaftesbury chooses its diverse roster of tenants. REIT: What are the unique sustainability issues that Shaftesbury faces? BRIAN BICKELL: Our buildings were never built to be efficient. The challenge is to make them as efficient as possible without destroying their character. We have lots of conservation legislation here, which means you are somewhat restricted. Within those constraints, Shaftesbury extends the life of existing buildings through changes of use and reconfiguration, giving them a much longer life than that expected of most modern structures. This emphasis on restoration and repair is environmentally significant and in line with government policy for maximizing the re-use of existing development land and minimizing the use of resources. But it’s also important to have economic sustainability within our buildings. Our skill is in finding new uses for the space in our portfolio. We are also big supporters of the Sustainable Restaurant Association and we give new restaurants subsidized membership for the first couple of years of their life. The association will help them with the sourcing of their food, designing their premises, dealing with food waste – all those nitty-gritty things. If we get people thinking that way at the outset, then it’ll hopefully affect their whole business. REIT: Shaftesbury is a member of the London Benchmarking Group, a global standard for measuring corporate community investment. Where does social responsibility fit into your business model? BICKELL: While the West End is a busy and lively place, there are lots of social issues around us. We have the usual problems of city centers, such as noise and drug issues. We acknowledge they are there and we put a lot of time and effort to support organizations tackling these problems wherever we can. We’d like to be seen as good long-term, socially responsible investors in our area, so that means being realistic about the problems as well as the benefits of being here. It does help that our local politicians see that we are prepared to invest and help them out in addressing some of these problems. Shaftesbury extends the life of existing buildings through changes of use and reconfiguration, giving them a much longer life than that expected of most modern structures. REIT: Why did Shaftesbury decide to invest exclusively in the West End? BICKELL: We embarked on this strategy over 20 years ago. The center of the West End is a very, very prosperous area. Regardless of what’s happening elsewhere in London, it’s always been a popular destination. The supply of building stock is limited here. A lot of the streets are really quite old; they are conservation areas, so there’s much less risk of some development-led oversupply. Because so many people come here for the shopping, the restaurants and cultural attractions, there generally is more demand for space than there is availability. Over the last 50 or 60 years, there’s been no cyclicality in rental levels for these uses. Rents for shops and restaurants have never gone down in all that time. There may have been the occasional year when they’ve stood still, but rental falls are unheard of in this area. People want to be here. It’s a good area to invest in, but we try never to be complacent. We’re always thinking about how life’s changing around us: trends in shopping, the challenges of the Internet and how we go about promoting our area. We have a big social media presence, lots of events that encourage people to come here. We try to be very aligned with our tenants and see it as a partnership. If our tenants aren’t making money, then we are not going to prosper either. REIT: REITs are a fairly new concept in the U.K. How well have they been received? BICKELL: REIT legislation arrived here toward the end of 2006, and we took the decision to convert in 2007. REITs came along here just as the property sector was going into its major downturn, and the early years were somewhat clouded by poor markets. People were generally not very interested in real estate at that time; most people were trying to get out of it, not into it. Now we’re seeing more companies taking on REIT status. It’s creating a bigger pool for investors to look at and it’s raising the interest level. REIT: How would you describe the level of competition for assets in the West End? BICKELL: It’s always difficult to buy West End assets because other people, like Shaftesbury, see them as great long-term investments. So why would you sell? The sort of assets we want to buy have often been in families for generations. We are generally up against a wide range of private investors, not necessarily from the U.K. Lots of overseas investors see London as a safe place to invest money. For the last couple of years, we’ve had a lot of money coming out of the eurozone, and it is generally wealthy individuals buying buildings for perhaps one [million] to five million pounds. REIT: With a geographic range of 14 acres, aren’t there limits on how far you can grow the portfolio? BICKELL: While we don’t want to buy anything and everything across the West End, there are certain streets we do look at very closely. It’s a question of whether we can actually become the dominant owner in that street because we do like to have clusters of ownership. That’s how our long-term management strategy works: Control an area, change its character and invest in it without having lots of other owners to consult with. The big challenge is to find areas where there are potentially enough sellers. It’s always very sporadic when things come up, but we don’t miss very much. If we find things, we do generally get what we want if they come to the market. We don’t get the sense our shareholders want us to be bigger for the sake of it, but they do want to make sure that we’re working our existing assets properly and producing the income potential that we say is there. REIT: What is the typical balance between acquisitions and capital expenditure? BICKELL: In an average year, we may buy £40 [million] or £50 million of new assets, and timing is impossible to predict. We have a very low capex model. Most of our buildings, certainly on the lower floors, are shops and restaurants. We don’t fit them out, but just supply the accommodation in shell form, so that the tenants have to fit them out themselves. We’d like to be seen as good long-term, socially responsible investors in our area, so that means being realistic about the problems as well as the benefits of being here. We don’t have the obsolescence you perhaps see in shopping centers and office buildings where every 10 or 15 years the landlord is faced with huge costs to bring the building up to modern standards. For us, all those costs sit with the businesses, so it does reduce our capex and obsolescence considerably. From an investment standpoint, we’re getting good rental growth from our assets, but we’re not having to spend an awful lot of money doing it. We create the space and then keep re-selling it. REIT: Shaftesbury takes a hands-on approach to its tenants – what are the benefits? BICKELL: Within our property team, someone will know every single one of our shop, restaurant and office tenants because we will have interviewed them. We do choose very carefully and we like to know how they are getting on. We walk about every day; we don’t spend our life sitting in the office looking at spreadsheets. We do collect turnover statistics and things like that for our tenants, but generally there’s nothing better than wandering into the shop and having a conversation. Just being in the West End is no guarantee of success for a business. These days, people are very fussy about how they spend their time and money, and you’ve got to have a good product to tempt people to part with their cash. REIT: How would you describe Shaftesbury’s tenant selection process? BICKELL: We’re not interested in the tenant’s covenant. Offering us the highest rent will not get you a space in one of our villages. We want to bring in interesting new ideas and concepts to our areas. If you come in to see us as a tenant, you’ve got to convince us that you are going to do something that will help our areas maintain their interest. REIT: What sort of flexibility does Shaftesbury have toward its tenants? We like new ideas and we’re prepared to take some risks. We always say that if we don’t have a few failures, we’ve probably been too safe. You’ve got to keep pushing the boundaries all the time. We don’t do high-end restaurants—it’s very much about casual, all-day dining. It’s the same with our shops: We don’t do luxury shopping. We try and find something that offers a good mid-price point with a positive experience that is accessible to the bulk of people who come to the West End.